What Can You Clean With Greenworks 1600? Greenworks Tools is a company that was formed in the US back in 2007 to market lithium-ion technology and outdoor power equipment, which were produced by a parent company Globe Tools Group. Since then, they have developed numerous tools and recently have expanded their reach into the Asian, Middle-Eastern and European markets with their products. We have reviewed various Greenworks 1600 psi reviews and tested out this model ourselves. We will present you with an unbiased review of 1600 PSI model since it’s one of their best-selling units. Given its low price and streamlined design, it’s an attractive choice for your light cleaning jobs around the home. We will share with you our views on the machine including its pros, cons and other valuable information. The first thing you will notice about the Greenworks 1600 is that the design of the unit actually has some style. It doesn’t look like your standard metal frame trolley that has a welded motor and pump on it – instead, it does look like a modern electric pressure washer. Thanks to the versatile design, the unit can function vertically or horizontally. This provides greater stability during use. It is a very lightweight model since it only weighs around 17.5 pounds. You can easily carry and move it around with you while you work. The 1600 PSI is achieved with a universal 13-amp electric motor. The motor gets its power via a 35-foot power cord with a circuit protector. It comes with an easy start feature, meaning there is no cord to pull, you just need to switch it on or off. The output is 1600 PSI at 1.2 GPM, bringing the total cleaning power score to 1920. This power is funneled into its 20-foot, non-marring, high-pressure hose. It is a durable hose which you can drag over concrete and other rough surfaces without worrying that it will get damaged or leave scuff marks on clean surfaces. Regarding the attachments, the Greenworks 1600 also comes with a wand, 2 quick to attach nozzles and a detachable detergent tank. The onboard storage allows you to keep all of the accessories safe and secure on the unit itself. The nozzle tips let you handle a variety of cleaning jobs. You don’t need any tools to assemble the unit, and you can do it fairly quickly. This pressure washer also comes with a folding handle, making it a very compact model. Greenworks has worked on establishing a network of service centers for their customer’s convenience but this has not worked as well as they have hoped. There have been reports of the company not having replacement parts on hand or not being able to back order new parts for their customers. Greenworks gives a 1-year warranty on this model, but it is not clear if attachments and accessories are covered or not. If there happens to be a problem, you need to contact the company directly via phone or their website, which also serves as an online store that sells replacement parts. The transportation cost of the unit or any of its accessories falls on the purchaser of the unit and not the company. The Greenworks 1600 may have a lower cleaning power than other models but it can handle light cleaning jobs as well as the most other pressure washers from the same performance range. It cleans cars, windows, wooden decks and patios, but we’ve also tested it on dirty sidewalks and driveways. The unit may be small but it came through with the work. It blasts away dirt, algae, grime and oil stains. Generally, it can serve as an all-purpose residential pressure washer. The unit’s light-weight design is very compact and makes it very portable. The variety of accessories allow you to handle cleaning your house very easy and fast. Its motor doesn’t produce a lot of noise. You can assemble it quickly with no tools. The price of this pressure washer is very budget-friendly and also it has a quite comprehensive user manual. Brass connectors have been reported to fracture and break prematurely. The unit comes with only 1 year of warranty. Getting replacement parts can take a lot of time and some parts cost more to deliver than the whole unit itself. 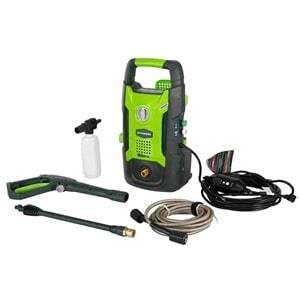 The Greenworks 1600 electric pressure washer was designed to be a very compact mobile cleaning unit meant for light cleaning jobs. The accessories allow you to get around the house and clean it from top to bottom. You can also clean your car, bikes, windows, patio furniture and decks. Also, the appealing design and low cost make it a fairly attractive package. If you are looking for something that can handle light cleaning jobs for your residential needs than this little unit could be the right choice for you. As a light-weight cleaning machine, it is not indented for prolonged use as it can cause the motor or pump to overheat and breakdown. Heavier stains can also be tackled, but it will require more time. Going through all the points in our Greenworks 1600 psi review, we hope that we have covered all of the important questions in our unbiased report. If we have left something out, please feel free to write down in our comments section. We will respond to your inquiries as soon as possible.